Chokoreto Keki ('チョコレートケーキ', is classified into sweets), is known as Chocolate Cake in English, and 巧克力蛋糕 (Qiǎokèlì dàngāo) in Chinese. 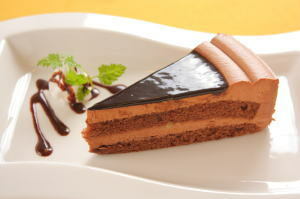 Choco Cake or Choko Keki. Egg, Wheat Flour, Butter, Granulated Sugar, Whipping Cream and Chocolate.